Location: Hotel Arkan Han is situated in Trigrad village, nestling at the foot of the West Rhodopes mountain, which offers a wide variety of activity holidays. 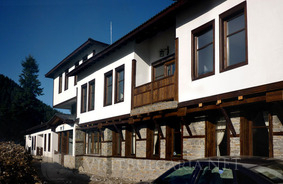 The hotel combines traditional architecture with modern comfortable facilities. Accommodation: Hotel Arkan Han offers accommodation in 10 rooms and 5 suites. All rooms are decorated in individual style and offer cozines. Rooms and suites at the hotel do not have TVs. TV's in the restaurant. Wine and dine: The main restaurant has a capacity for 40 guests and offers cosy atmosphere and a wide selection of specialties from Traditional Rhodopi cuisine. Samar Bar is the place for a cold drink and entertainment. Located next to ARKAN Horse Center, it is a cocktail of beautiful views, with a touch of great music and a pinch of romanticism. - organization of different activities such as team building, weddings, birhtday parties, business seminars, etc. The base has 17 horse and for 10 years it has proven itself to equestrian professionals and lovers of the horse sport worldwide.